I made 5 cards to enter the challenge at the Christmas Cards All Year 'Round with the freebie image "Fallin' In Love" from the Delightful Inspiration. Today is the last day of this challenge for January 2010. I MADE IT! This is a good challenge to keep up the Christmas spirit all year 'round and get ready Christmas cards when the time comes for OWH. Whew~ This week has been so busy. I haven't had enough time to catch up everything and I must have missed a lot. Anyway, I didn't want to miss the January FREE Stamp Week #4 Challenge at the Delightful Inspiration so I made this card while David is waiting for our Sunday brunch. 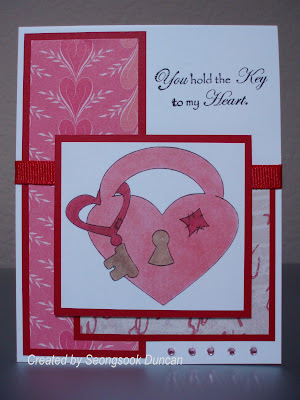 I used the sketch from the Stamping 411 to enter their Saturday Sketch Challenge 136 as well. Thanks for freebie image and challenges. Wish everyone a nice Sunday! Woul you like to join the OWH Stars and Stamps? I am sorry to hear about it and have to share this freebie from the Karen's Doodles. This weeks challenge is "PURPLE, WHITE & A SPLASH OF BLACK! The Digital Stamp was a freebie at the Sew Many Cards. 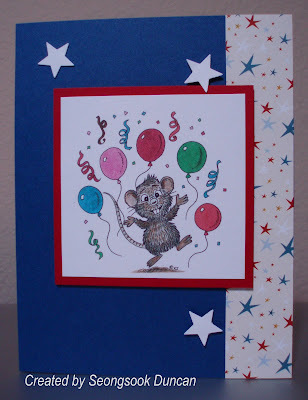 I made this card for Stars and Stamps Sketch Challenge #1. This is a new Challenge Blog of the Operation Wrtie Home. I am so excited to participating in this challenge. This is the sketch and what Sandy said: You can use this as-is, tweak it, turn it sideways, layer like mad if you wish—it's an idea-starter! Bonus applause for you if you incorporate a star into the card, in honor of our new blog's name! I used a freebie digital stamp from Karen Johnson of Karen's Doodles. Thanks for the challenge and inspiration. * Delightful Inspiration - by using this image "Puppy Love"
This is a different way of play along with challenges. Everyone that plays gets FREE digital stamps! For more detailed information, please visit the site. The image is a new release by Michelle Perkett. I love her images and enjoy coloring them although I don't have the right color of skin tone. Besides, it shows darker and more pinkish in the photo. Thanks for challenges and inspiration. Digital Image is "Love Collage" that I purchased at the Designed2Delights. I cut out the bird image and popped up on the original image although it doesn't show well on the photo. For coloring, I used BIC Mark it. Thanks for the challenges. Wish you all peaceful weekend! 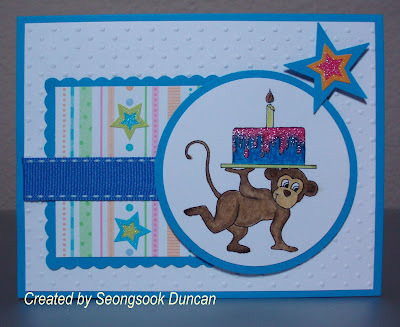 This card is for Michelle Perkett Studio's Challenge #12 on Paper Craft Planet by using one of her images. Thanks for one more day to play along with more challenges. * Magical Monday - RBGs by using the freebie elephant image "Tons of Love" RBGs. It's Red Ribbon, Buttons, and Glitter or Something that Sparkles! * Magical Monday - Stripes by using a Freebie Digital Image: "Miss Kitty"
This card will be very good as an Any Hero Card. This card is made for Sparkle Creations: 2010 Christmas Card Challenge #6. 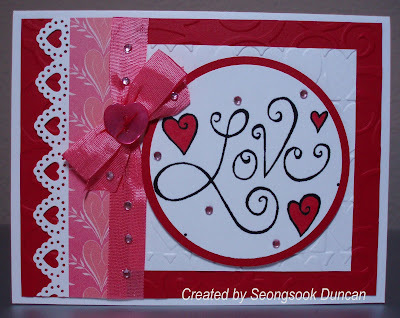 This week's challenge: Dry Embossing! Use any dies or folders to emboss an image or background on your card. This card is made for Card Maker Monochromatic Challenge. Image is from Fred She Said Digital Designs. I copied this from the Operation Write Home Homefront Blog post. 1.Missing My Kids: Create 20 missing-you cards appropriate to send to children and mail them to a shipper by Jan 31. 3.TwentyTen challenge: A bigger challenge that could last you all through 2010! One month you make and send in at least 20 cards, the next 10 cards, the next 20, and so on. It's small goals that can keep us moving!" 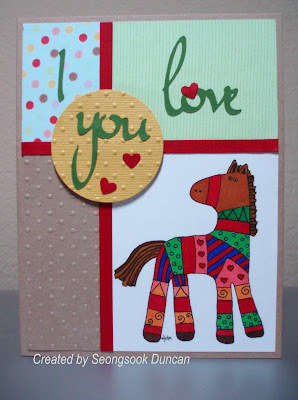 This card is for Patti, my dear friend, who is hosting the Magical Monday - Color Challenge with a Painted Pony Image. I hope she likes it. I used the Unscripted Sketches #37. I think I could use a different sentiment such as Love or Happy Birthday as well for this card. I enjoyed making this card. 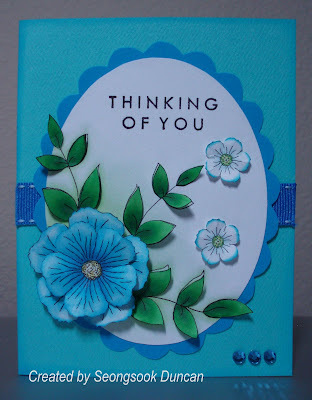 * Card Maker Weekly Challenge hosted by Angelina by using textile. This card is for Mercy's Tuesday Sketch Challenge #55. 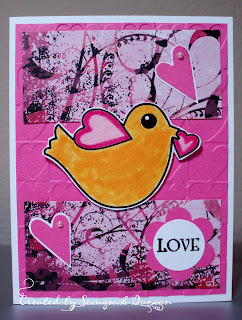 The Image is a Michelle Perkett Studio's Valentine Freebie. This card is for the Cute Card Thursday sketch challenge that Alison of Strech N' Bubbles is sponsoring.